We love going places we’ve never been. We drive and then stop, again and again. We love having a house that takes us around..through mountains, valleys, and each little town. We love that our animals can all come along.. for as long as it takes.. for as long as we’re gone. Yesterday, we drove up to Mt. Baldy. It’s a short drive from Ontario where Gus lives. We have time to relax, and time to explore. Who could ask for anything more? It was 22 years since we’d seen friend JoAnne. We’ll see her twice, in a one year span. We saw cousin Val two more times than we would have. She broke her crown, one more time than she should have. BROTHER BILLY AND LIZ TOOK GUS, KIP, AND ME TO A WONDERFUL DINNER. NOW A FOND MEMORY. We look forward to seeing Patti and Jim. Some of our most treasured times are done on a whim. I’m writing this poem while betting on horses. We’re watching the races and eating three courses. I PICKED A WINNER, BUT IT TAKES MORE THAN ONE, FOR BILLY AND GUS TO HAVE ANY FUN. Was that horse 5 in the 7th or horse 7 in the 5th? Tomorrow the family will come spend the day. We’re having a picnic at camp KOA. If you’ll be seeing us soon, I guess I should warn ya. We’ve eaten our way through Southern California. New Mexico, Arizona, Utah, and Nevada..we had more to eat than we shoulda hadda. We try to remember, when we eat all that stuff..We’re not too fat. We aren’t tall enough. We’ll say bye for now. Let a new day begin. We know where we’re going. We love where we’ve been! WE’RE COMING TO THE PICNIC..CAN WE BRING ANYTHING? Murdo Girl…The Brick House..What’s tat? It’s Monday morning in Murdo. After enjoying a nice shower at the truck stop, Murdo Girl is walking up Coyote Hill to The Brick House. Such has been her routine since she became Next Pres and took up residence at the old Murdo High School, which is in the process of being transformed into Murdo’s answer to The White House. As these things usually go, they’re a little behind schedule for the remodel. You can hardly get people to work for next to nothing these days. At the very least, they want a sandwich. Even so, the History classroom has been decorated and renamed the Rose Garden room. The Chemistry/Biology room is now the employee lounge. The fermaldyhide smell is barely noticeable. Just don’t look in the ice box. There’s a few crawlies and growies in there. The Superintendent’s office is now the Oblong Office. The English room is still the English room. Queen E has been staying there ever since the weather turned cold, and it was no longer practical to camp out in her coach RV. As she walks up the stairs to her office, Next Pres Murdo Girl hears rumbling coming from the employee lounge. She chooses to ignore it. She has a lot of Next Pres stuff to do. She hears footsteps behind her. When she turns to see who is following her, she runs smack dab into A I.
Murdo Girl: Morning A I. Must be a slow day in Spysville. Can I help you with something? A I: I’m just doing my job MG. Trying to keep you informed. Can you believe Lav? I was just in the employee lounge. I swear that girl has clown written on her forehead. Murdo Girl: Now A I, that’s not a very nice thing to say. Lav might be a little slow on the uptake, but there’s no need to ridicule her. A I: I love Lav MG. I would never ridicule her. I’m just saying she has clown written on her forehead. Just then Lav walks in. Murdo Girl: Lav, you have clown written on your forehead! Lav: It’s a tatoo Next Pres. A I: See..that’s what I’ve been saying. Tough tat Lav. You can’t ever get rid of a tatoo. You just as well tatoo two balloons on your cheeks. Then you would for sure look like a clown. No Lav..no more hiding behind a tumbleweed. Lav: I’m sorry MG. I asked for a crown tatoo, and this is what I got. It says clown. Besides that, I wanted a picture of a pretty crown with sparkly diamonds. A pretty permanent crown on my forehead. My real crown broke you know. Murdo Girl: Where did you get this stupid idea Lav? It’s 1970 something. Tatoos on girls aren’t even popular yet! Lav: Huh? I guess I’ve always been a trendsetter. I like being first. When I broke my real crown, I thought about it and decided I’m a pemanent Queen VP. I should have a permanent crown. One that doesn’t break or fall off. While Lav is explaining it all, Pico walks in. Pico: Murdo Girl..I’m here to offer you my services. We need to have a plan that when carried out, will lessen the impact of the revelation of the tatoo on Lav’s forhead. Notice I didn’t refer to the abomination as a clown tatoo. The sheer fact that Lav has a tatoo is a violation of the public trust. Let’s not complicate the matter by disclosing the fact that it’s a clown. Let me look at you Lav..How much will your bangs have to grow to cover the clown up? Geez Lav, did you cut your bangs this short before or after you messed up half your face? Murdo Girl: Geez Pico. What office are you running for? Sherri the Photographic Drawer strolls in followed by TC the Town Cryer who takes one look at Lav and runs out of the room..crying of course. A I: Well, so much for keeping the clown under bangs. TC will town cry it to the whole town. Sherri: Wait MG..I think I might be able to fix it. Let me see Lav. Yes, If I draw a line here like this, a circle like that, and connect these dots…see? What do you think? Murdo Girl, A I, and Pico gasp in unison. DM walks in. DM: Hi..Um, why does Lav have a picture of Abraham Lincoln on her forehead? Lav: She has been unusually quiet through all of this. Suddenly she finds her voice. WHAT?? She runs to look in the mirror. Obviously horrified, she grabs her head. I HAVE A PENNY ON MY FOREHEAD!! Jerry the Bean Counter walks in. Jerry: You say that like it’s a bad thing. As of right now, you have more cash on your forehead than we have in our coffers. Treason the Press Sec and Carol the singer walk in. The only one Next Pres Murdo Girl hasn’t heard from is the Queen, but she’s not really part of the cabinet. She’s more like an Ambassador. Treason: I just came from the Coyote office. TC was over there blubbering about Lav having clown written on her forehead. The Editor told her it wasn’t exactly nice to be making fun of Lav, just because she acts a little goofy sometimes. Hey Lav, what is that on your forehead? A penny for your thoughts, hahaha..Sorry. Murdo Girl: Looks around at her less than stellar cabinet and sinks into her chair. How did this happen? She wonders. Oh, she knows they all mean well, and it’s not like they’re getting paid. The truth is she loves this crazy bunch of misfits. She finds herself rising from her wobbly chair with her head held high. She is filled with a new resolve. After all, she is the leader of the free town, and it’s her job to fulfill some of those campaign promises she made. Tomorrow will be the beginning of a new tomorrow. It is the day of her State of Murdo Address to the town. Her thoughts turn to her prepared speech. Murdo is the very first town to have a President. It’s even had a Governor. So what if he was a horse? Val and I wanted to show you a typical day in the life of a Queen. It’s not always about crowns and red convertibles. Sometimes we have to participate in the same activities as you commoners. We do however feel compelled to wear our crowns wherever possible. We are Queens..and Queens have to do what Queens have to do. Gus wanted to show off his royal family to friends attending one of the Ontario Senior Center’s exercise classes. Gus is working out behind Queen Valerie. In this photo you can see others in the class looking at us. We tried not to be too much of a distraction, but of course that proved to be impossible. We really worked up a sweat during the facial exercises. If you do these, be sure and follow-up with some facial stretches. Otherwise, your face might lockup in a strange expression. We have seen it happen to others and it’s not pretty. Val and I were in the alcove adjacent to the gym when I was reminded of a story. I was visiting my parents back in ’95, when one day they asked if I would go to the senior center and exercise with them. When we pulled up in front, Gus asked Mom if she was going to tell me about her “situation.” She looked down as if ashamed. She told me she had gotten into trouble for talking too much. Rose, who led the classes, made Mom exercise in the little alcove. Of course like any other kid, Mom swore it was not her fault. The lady standing next to her was the one who started the annoyance. It was a proud moment for me as I watched my Mother walk over and pick up her exercise stick. With her head held high, she marched over to the alcove where she enjoyed a strenuous workout. I snapped this pic of Gus, Val, and Kip with our fabulous instructor Priscilla. Kip brought the doggie poop bags, which he carries in a little holder hanging on his belt. Thankfully none were needed. After our workout, we attended a reception held in our honor, at the Ontario Bakery. They have wonderful danish pastries. I recommend the cherry roll…or maybe the bear claw..the cheese danish was to die for. Dining under the stars the night before. We had cheeseburgers for lunch at Andy’s before taking Queen Val, aka Next Vice Pres Lav, to the airport. It was a tearful goodbye. It was made even more poignant by the courage Queen Val displayed upon discovering a very prominent piece of her crown had broken off during the exercise class. Later that evening, Gus treated Kip and me to a steak dinner at the Legion Club. It was a very enjoyable evening complete with peach pie and karaoke. I resisted singing one of my hit tunes, “Big Girl’s Don’t Cry,” by the Four Seasons. Kip suggested it might prematurely empty the club. So..It was a typical day in the lives of two Queen’s doing their Queenly duties. It’s a small sacrifice to occasionally mingle with people whose lives aren’t otherwise very glamorous you know. If I hadn’t seen it all with my own four eyes, I wouldn’t have believed this story ever happened! Murdo Girl…On the road..day 17..The unexpected gift we’ve all been waiting for. Kip and I arrived in California Saturday around 6 pm. We normally try to get to the RV park early enough to set up before dark, but we got a late start that morning. 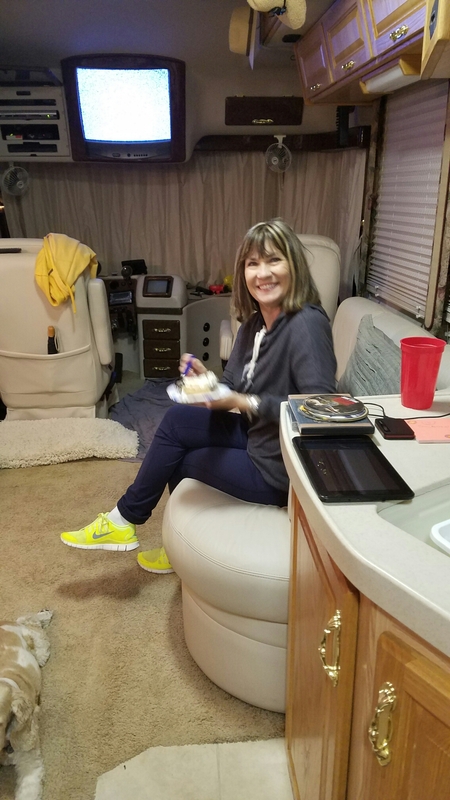 We are staying in the Pomona Fairgrounds KOA RV Park, which is between Los Angeles where my brother Billy lives and Ontario where our Stepfather, Gus Gustafson resides. Many of you Murdoites know Gus. He and Mom were married 38 years before she died in December of 2008. He is a special man and a very important part of our family. We’ve had the added pleasure of a visit from cousin Valerie. That’s her lime green shoe in the picture. Val’s Mom, Ella and my Mom, Loretta were sisters and close friends. I wrote about their frequent phone conversations in “The Call Girls” blog. Valerie is a very special cousin and friend, and I love that she has joined in on the Murdo Girl fun. It was really a special honor for both of us to ride in the All School Reunion Parade last July. Sitting in the red convertible with our gowns and crowns on, was incredible. Even as we get a little less young, and our memories get fuzzy, I know neither of us will ever forget that special day and all the fun we had throughout the week-end. All that being said, I want to tell you about yesterday and another super great experience Val and I got to share. Growing up in Murdo as part of the Sanderson family was an incredible experience. I always told people I was related to everyone south of 16. That was a pretty big stretch, but it doesn’t matter. M.E. and Mary Sanderson lived there as well as lots of Aunts, Uncles, cousins and friends. Our family shared some wonderful times and as most families do, created lasting traditions. It all revolved around Grandma and Grandpa. I can hardly see through tears as I think about what they brought to the lives of their kids and grandkids. Many of those special times we spent together were recorded by Aunt Irma Sanderson’s 8 mm camera with the row of hot, bright lights. In 1990 our cousin Mark Sanderson put together snippets of her films and transferred them to a VHS tape. I brought my copy of that tape to Murdo with me. I also brought the tape he gave me of the 1991 All School Reunion Talent Show. I hadn’t had time to get them transferred to a DVD, but for some reason, I brought them anyway. I had them with me when Val and I met several people at the diner for breakfast one morning. Ralph Thomas was there and he offered to find someone to transfer them. Right before Kip and I left on this trip, I got several sets of DVD’s in the mail. Ralph had made it happen. Knowing I would be seeing Valerie, Gus and Bill, I brought them their copies. (Is this blow by blow or what?) Last night after filling up with pizza and Marie Callender’s chocolate pie, Kip, Gus, Valerie and I watched these treasures that spanned the years from 1957 to 1991. Gus and Kip enjoyed them, but Valerie and I laughed, cried, jumped up and pointed as we named the people and places throughout. Our Grandpa and Grandma Sanderson’s 50th anniversary was celebrated with an open house in 1961. We watched most of the residents of Murdo come through their door, sign the guestbook, drink coffee and eat cake as they honored the anniversary and visited with each other. Many have been gone for years, but in a way it seemed like we just saw them yesterday. Everyone was dressed up. The ladies wore dresses and hats, and the men all had on suits and ties. We watched a separate celebration held a couple of months later when the Iowa relatives and the Haverberg and Leckey families could be there. We watched a snippet of the Nemo Cabin and some of the family Christmas Eve celebrations, Easter Sundays and birthday parties. Then..I saw it! I jumped up, screamed, and pointed, which scared everybody. Valerie saw it too. Finally, there was the proof. The undeniable, visual, recorded truth. The beginning of it all. The seed that grew into the stories of Murdo Girl. I thought I heard Kip groan. How rude. He knows how shy and unassuming I am. I have always been full of humility and rarely talk about myself. Oh, I might occasionally tell a story or two. After all, I am M.E. Sanderson’s granddaughter. First we saw my horse Governor. He was pulling a red wagon with a kid’s folding chair sitting in it. On that chair, dressed in her red Kitty Reynolds gown and wearing a tinfoil crown, was Murdo Girl. The Queen of the neighborhood parade. It was far too brief, but it was there right before our eyes. I will find a way to get a screen shot so we can all look at it over and over and over again. We stopped for gas and look who I ran into..At least we’re on the right side of the fence. It might appear as though Kip and I are trying to surround the Grand Canyon. Last year we went to the Southern Rim, and last week we spent a day on the Northern side. Today we went to the Grand Canyon West where the dreaded Skywalk is located. We loaded the doggies in the Jeep and made the hour and a half trip. The drive was different from the others so far. We saw flat land with sagebrush, then a virtual forest of Joshua trees before getting into the mountainous area closer to the Canyon. The first place we came to had helicopter rides and all kinds of busses and shuttles. It was also where you purchased your tickets. A security officer told us where we could board the dogs for the day, so we got our tickets and drove over to a place called The Hualapai Ranch. It’s a cute little staged western town. They have a general store, mercantile, root beer saloon, a telegraph office, and a place you can rent horses to ride. A very nice cowboy met us at the barn where they take care of the pooches. Kip under the noose, me with the skeleton horseman, a team of horses, and the barn where they board the dogs. The other side also has a row of western stores. Next, we went by shuttle to Eagle Point, which is the location of the Skywalk that protrudes over the 4000 foot deep canyon. As we walked over to see what it was all about, I was alarmed to see people walking dangerously close to the edge of another part of the Canyon. There were no barriers at all. One slip or a fainting spell would mean lights out. I would never take a child to this viewpoint. I snapped the first picture of a guy I thought was standing dangerously close to the edge. Now that I look at the pic Kip took of me, I was standing pretty close too..Yikes! The bottom is a far away picture of the Skywalk. I’ll have a better one, when I can go online and get the one they took of us. We got in a short line to walk out onto the horseshoe-shaped glass bottom bridge. It costs $16.00 if you want to have your picture taken while we you’re out there. You can’t take cameras, purses or anything loose with you, because they don’t want people dropping things over the side. They provide a free locker to store your stuff and cotton booties to wear over your shoes so you don’t scratch the glass floor. Kip and I got our picture taken because certain people won’t believe I went out there without proof. I wasn’t that afraid, because after I sneaked a peek, I didn’t look down through the glass floor again. We have to go online in a couple of days to pick out our picture. The ticket price included lunch that we could have at any of the three viewpoints. We ate at the Skyway at the Skywalk. It was past our lunchtime and we were hungry. We got our sandwich and chips and ate at a table in a covered area outside. Although windy at times, it was another sunny but reasonably cool day. Kip was in a hurry for lunch and forgot to take his booties off. After lunch, we got on another shuttle that took us to the third viewpoint which is called Guano Point. It offers a highpoint hike. When you reach the top there is a panoramic view of the Grand Canyon and the Colorado River. Kip climbed up there and said it was great! I stayed down below and took his picture. Before he climbed up there, I asked him if he thought he should give me the keys to the car just in case. He laughed.. I guess he thought I was kidding. I took this picture of Kip at the top of Guano Point. Kip took the top right photo looking down from the top. The cute little couple on the bottom right asked Kip to take pictures of them. They were also at the top. This all took us about three hours, but you can take as long as you want. There are shuttles running every five minutes. We took one back to the ranch, picked up our pooches and drove back to Boulder City. It was another great day on the road. Tomorrow we head for Southern California for some family time. I thought you might like to see some pics of the Hitch-N-Post in Kanab, Utah where we stayed the previous 4 days. I’ve included a few photos of our home away from home. It’s 15 years old, but it has been very well cared for. We left Kanab Wedesday morning and drove to Boulder City, NV. Today we’re going to see Hoover Dam and possibly drive to the West side of the Grand Canyon. Kip wants to walk out on the Skywalk, which is a U shaped structure that protrudes 70 feet over and 4000 feet above the Colorado River. I’m selfless. I’m just that kind of person. I volunteered to stay behind with the dogs. The puppy dogs and the kitty are such good travelers. They get a lot of exercise and so do we. They get more nap time than we do though. We spent a fun day driving through Zion National Park, which is about 40 miles from where we’re staying in Kanab, UT. We went to the Pink Coral Sands State Park too, but it was just miles and miles of pink sand. There isn’t much to see or do there unless you have an ATV. That was okay, because we had to make some time to do our laundry tonight anyway. We have stiff necks from looking up for three days, but it was impressive to say the least. We didn’t have time to see all the things we wanted to in this little berg called Kanab, but hopefully, there will be a next time. If you ever decide to vacation in Southern Utah, this seems to be a great time of year to do it, and if you’re bringing your RV, Ron and Linda at The Hitch-N-Post are terrific people and their park is super nice. I picked out the best of the photos we took at Zion. We loved it for it’s beauty, but we also enjoyed the 2 mile paved path that was dog friendly, and it followed a pretty mountain stream. Coming out of a mile long tunnel. We washed the yellow sweatshirts today! Tomorrow we head for Nevada. It will probably take us two days to get to Hoover Dam. Cousin Val, (Lav for short), sent this picture. She and Ken took a road trip to Portland, Oregon to see their daughter and son-in-law. They stopped in Eugene at a fish market to eat and ran into this handsome guy. I prefer cowboys. It’s Monday morning at the Brick House. Murdo Girl is in the Oblong Office enjoying the peace and quiet. Life is good. Being Next Pres hasn’t been easy, but things appear to be calming down and coming together. She stands to stretch her legs before continuing to work on her “State of the Murdo Address.” Yes, The Brick House is the people’s house and Murdo Girl intends to make the Murdoites proud. The rest of the nation will stand up and take notice! Oh.. some might say it’s but a pipe dream, but Murdo Girl knows one thing for sure. If Washington ran like Murdo runs, there would be order in the streets again. Never mind that other than Otis, the only lawbreakers in Murdo have been members of her Cabinet. Two are currently in the Jones County Jail. A noise outside interrupts Murdo Girl’s ruminating. What? Is that a bus pulling up out front? Who is that getting off? It’s Yram. Within a couple of minutes Yram has made her way to the Oblong Office. Murdo Girl: Has it been two days already? I can’t believe it’s been two days already. So you’re out of jail? How did you happen to get on that bus? Yram: Yes Next Pres. They let me out of The Big House and I took a bus to The Brick House. You know when you’ve done your time, they give you $2.00 and a one way bus ticket. Thankfully, my clothes still fit me or I would have had to wear standard issue clothes. I’m not sure what they look like, but they sound pretty drab. Murdo Girl: You weren’t in The Big House Yram. You were in the Jones County Jail. I’m going to have a talk with Barney about the bus rides and money. That comes out of my jailhouse budget. Yram: Does that mean I’ll have to give the $2.00 back? I’m totally rehabbed MG. From now on I’m doing things by the book. No cutting corners. There is one little problem though..when you’re a crack up interviewer like I am, sometimes you have to teeter on the edge, push the envelope a little, ruffle a few feathers. Murdo Girl: You’ve got that part down. Where is Jerry? He must be out of jail too. Did you two get all of your apology letters written? Yram: Gee, I don’t know MG. When those doors slammed behind me, I never looked back. Hey..I just figured something out. That’s why they call it the slammer! I will say there’s nothing like that first breath of fresh air once you’re on the outside. It could be that Jerry joined up with the other prisoners and rioted. Some of them took their tin coffee cups and ran ’em across the bars of their cells, which made a big racket. Deputy Fife was getting all twitterpated. Murdo Girl: Yram, there were 3 prisoners..you, Jerry, and Otis. I have to get back to writing my speech. I want copies of all the letters of apology on my desk by noon tomorrow. I don’t care who writes them. We must implore all those who have a restraining order against you to drop them, and it won’t be easy. Your job is on the line Yram. Yram: Okey Dokey Next Pres. I’ll get right on it. Right after I see who’s hanging out in the employee lounge. Meanwhile things appear to be a little tense in the employee lounge. Lav is sitting in the far corner nursing a mocha latte. Everyone seems to be blatantly staring at her. Lav: Why don’t you draw a picture it’ll last longer. Sherri the Photographic drawer: I am. Could you move your chair a little to the right? The lighting is better. DM: This is going to change the way the whole world looks at you Lav. PICO: You no longer fit the image of a Next Vice Pres. A I: You want me to fly ya somewhere Lav? Maybe you should get out of town for awhile. Treason: Since I’m Press Secretary, I should make sure we get out ahead of the local news on this. The Murdo Coyote will have a field day. It could be fun! TC: Just lay it on me Treason and I’ll town cry it! Carol the singer: It reminds me of that song, I did it My Waaay. Maybe it’s because that’s the only song I know. About that time, Yram walks in. Meanwhile, Jerry is in the Oblong Office talking to Next Pres Murdo Girl. Jerry: I thought you might want to take a look at one or two of the letters Yram and I wrote in preparation of her apology tour. She has to deliver them in person right? There are 6 restraining orders, that we know of. She got rid of the house arrest with time served. Murdo Girl: Pick one and read it to me Jerry. I’m really sorry that I crashed your party, ate all of your wedding cake, and drank all of that really good punch. I just wasn’t myself that night. I didn’t really refuse to leave, and for the record it was Lav’s big idea to sit in the red convertible and watch the burning of the M all night. I only recall being asked to leave twice, and I’m pretty sure I didn’t think you meant it. So how about it Mr. Lindquist? Drop that dumb old restraining order, or at least drop it down to 250 ft instead of 500. I can’t even see that far. Mr. Applebee is going to kick around the idea if dropping it to 300 ft instead of 500. I still won’t be able to attend any football games, but life is all about compromise. Coming up…Why is everyone staring at Lav? Will Yram’s apology tour get her closer to her goal..(of 250 ft)? Will the Queen quit scowling? Is she posing as a Green Beret? These people are wearing me out! I don’t know where to start. I’m speechless. How can I show you just a few of the dozens of pictures we took today? This small town of Kanab, Utah is central to so many unbelievable geological wonders. It’s not just a stop along the way. It is a stand alone destination vacation. After spending two full days visiting the Grand Canyon, Bryce Canyon, and taking the drive along Highway 12 to Escalante, we have barely scratched the surface of things to do and see here. We’re only staying one more day, but this is definitely a place we hope to come back to in the future. The RV Park host and hostess recommended the Houston Trails End Cafe for breakfast. I had a vegetable omelet, hash browns and sourdough toast. The picture shows what was left after I had eaten my fill. It was so delicious, I just couldn’t leave it there, so I asked for a “to go” container and we drove my omelet around in the car until it turned gross enough for me to throw it away. Kip’s pancakes, thick applewood smoked bacon, and eggs were also good and more than he could eat. The cowboy picture was taken at the Cafe. Just to be clear.. I’m still collecting water tower pictures not statues of cowboys. The pictures we took at all the scenic overlooks in Bryce Canyon National Park, and our drive to Escalante will tell their own story. Pretty amazing. Don’t you agree? We found a meadow where the dogs could run their little hearts out. Going home after a fun day. The weather was perfect! Look out the windows kids! You’re not even paying attention! Tomorrow we’re going to Zion National Park, and also The little Hollywood Museum here in Kanab.